It’s been a week since I made the Digg front page for the first time and I thought I’d reflect on it a bit. Bored on a Saturday night and laughing about my bank telling me about my Google check bouncing, I decided to blog about it and go to bed. I awake the next day get my coffee and make my way to the computer. 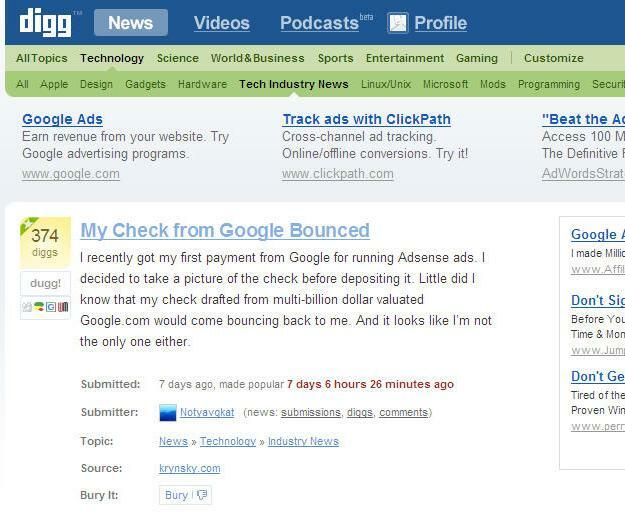 I run a Firefox extension called Adsense Notifier which syncs up to my adsense account and displays impressions, click-thru rate and earnings in my status bar. When looking at it this morning I realized that I had already served about four times the number of impressions I usually serve in a day. I immediately had a feeling that a high traffic site must have linked to me. So I went to my home page and sure enough I was down. I immediately went into live chat with my great hosting company Bluehost. The admin on duty was taking a look and suggested I grab several logs from my server to try and debug the issue as well. He pointed me to a directory were there was a folder titled “cpu_exceeded_logs” and another one called “mysql_slow_queries”. There were only a few logs on some scattered days, and the logs averaged under 100k, but there was one generated on this day that was 1.32Mb…oh oh. Going through the log it basically listed get requests with execution times. Most entries were 2-3 hundreths of a second…but then I came across a plugin which after executing was followed by a 5 seconds of cpu time for the sql query to run. I use WordPress to power my site and was able to get to my admin screen, and de-activate the plugin. I had also previously been familiar with a plugin called WP-Cache to increase performance in WordPress by caching pages and limiting database queries which I thought would be nice to need some day. Well today was that day. So I installed it, and watched as it started caching my site. Shortly after that my site was back up. Now it was time to figure out where all the traffic was coming from. A quick view of my traffic showed that Digg was a huge referrer with a title that described a post I made the night before. I have to admit I had a few butterflies knowing that someone must have submitted it and it was gaining popularity. It had around 250 diggs. I didn’t know Notyavgkat who was the submitter and was curious as to how he found my post. So I started to read the comments and refreshed the page every few minutes. 270 diggs…290 diggs. I then message a few friends telling them about it. Wow…congrats…good job…the responses were coming in. Apparently my site was down for quite a bit so there were a few comments that took a deserving shot at me. Submissions can also be removed by users with the “Bury Story” feature within Digg. 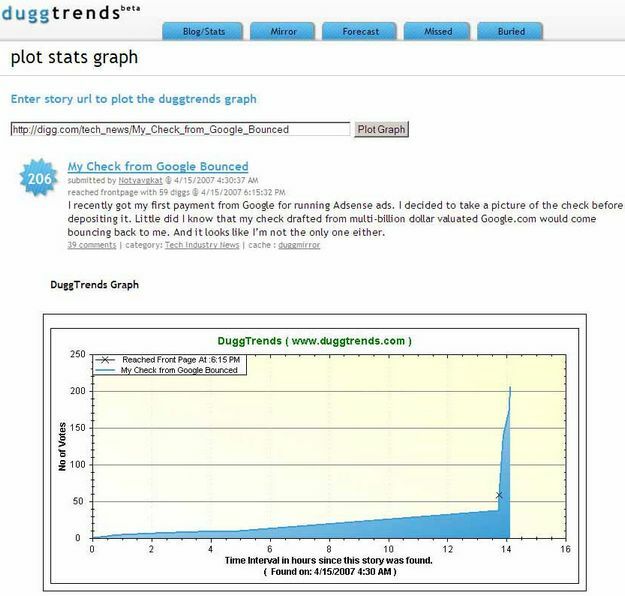 Once a story receives enough “buries,” it is automatically removed from the Digg Upcoming or Popular sections. The number of reports required to bury is based on a sliding scale that takes several factors into consideration (such as number of Diggs, reports, time of day, topic submitted to, etc.). Buried stories can still be found the profiles of users who have Dugg the story; you can also find them by doing a search. It appears that there is a bury brigade in existence which isn’t surprising since I’ve read several stories about a small group that seems to have control of what makes the front page. I did however start using Duggtrends which offers a page dedicated to buried stories which makes for interesting reading to see which stories are being “censored”. 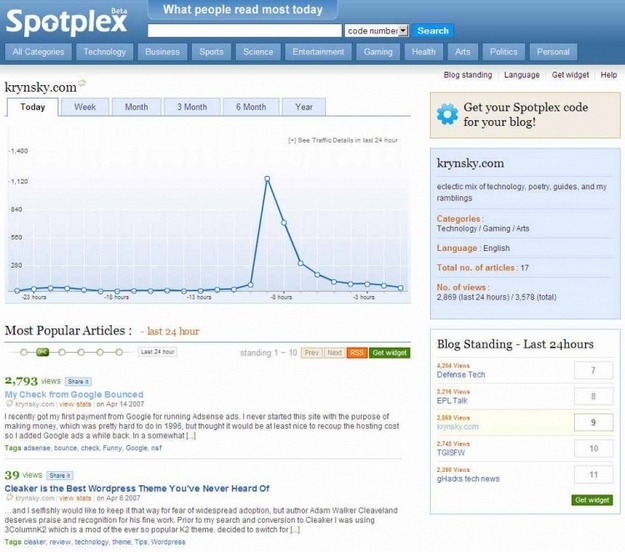 Spotplex is a site that was created with the goal of a true democratic system which so many people feel is a huge flaw in Digg’s system. TechCrunch and several other sites have provided their views. I became a member and have enjoyed using their site. 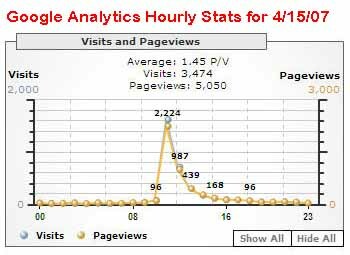 It was interesting to see how my site’s rank rose on their system. Especially for a story with Google as a tag. WordPress gets a bad rap on Digg when sites using it make it to the front page so I was happy to see a story titled “WordPress Performance: Why My Site Is So Much Faster Than Yours“. It’s a great post from Elliott Back, whom I’ve mentioned before as the author of a Lifestream plugin for WordPress, that discusses tweaks you can made to your server setup, php, mysql, and apache settings cache to improve performance using caching. It was nice to see all the haters commenting on how this WordPress site was surely going down now that the post made the front page. But it looks like it never did. I also frequent the beautifully designed site by Nick La and have used his Glossy Blue WordPress theme. He too hit the Digg front page a few days ago with the release of his iTheme WordPress theme. He felt the pain as well and posted a good story on the aftermath with resources. Lastly, in an ironic twist of fate I actually did pretty well with Adsense on the day I got Dugg, actually earning just enough to cover the returned check fee from my bank. Go figure.